After a month of war, munitions began to run out. Demand was 10 times production. Taking refuge at Bordeaux after 2 September 1914, the French Government very quickly understood that war production had to be organised. 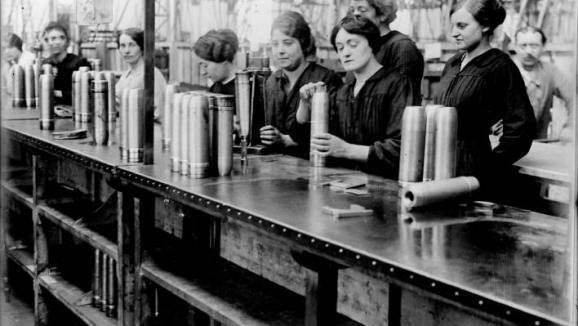 Private companies and hospital centres far from the front were pressed into helping with the production of munitions, arms, materiel etc. The Minister for War, Millerand, called a meeting of industrialists on 20th September. This date marks the start of the tremendous industrial mobilisation which took place. The Government created 7 regional groups of businesses around the major production plants. Louis Renault was appointed coordinator for the group of industries in the Seine region, which numbered over 900 establishments in 1915. The aim was to meet the needs of the Army by increasing production, distributing the workload and sharing labour (500,000 workers were called to the front by 1915). Book : Laurent d’Albis (dir. ), War Factories, ETAI, 2015.